Earlier this month, Catalonia tried to vote on secession, but the Spanish government sent riot police in to assault citizens trying to vote, and stopped the proceedings. Today, Catalonia’s regional parliament voted for independence with 70 in favor and 10 opposed. Shortly after the vote, Spanish President Rajoy tweeted “I call tranquility to all Spaniards. The rule of law will restore the legality in Catalonia,” and the Spanish government invoked article 155 of their constitution—which gives them power over regional authorities in Catalonia. Rajoy said that his next move after the Senate ratifies this decision would be to dismiss Catalan Regional President Carles Puigdemont and his ministers. Catalonia is a region to the northeast in Spain—right on the French border, and it has avoided much of the economic strife which has engulfed the rest of the country. Spain’s unemployment rate is 17%, about four percent lower than that of embattled Greece. Only the Greeks have a higher youth unemployment rate (43.3%) in Europe than Spain does (38.7%). Spain’s GDP has been on a fairly steady decline since the 2008 financial crisis, although it is beginning to bounce back a little bit. Spain’s economic struggles are yet another demonstration of the failed currency union sans political union that is the Euro. Catalonia enjoys 7% higher employment than the rest of Spain. Their GDP per person is 7% above the European Union average, whereas the rest of Spain falls 8% beneath the EU average. Catalonia contributes a higher percentage to Spanish GDP than California does to American GDP (and California’s economy is roughly the same size as Russia’s). Much of Catalonia’s economic might stems from their farm holdings, which is nearly double that of the rest of Spain. There are plenty of good reasons for Catalonians to want to leave Spain, and that’s before we get to the fact that they speak a different language (Catalan is a descendant of the Latin language spoken by the Romans), and have always had an independent streak to them. 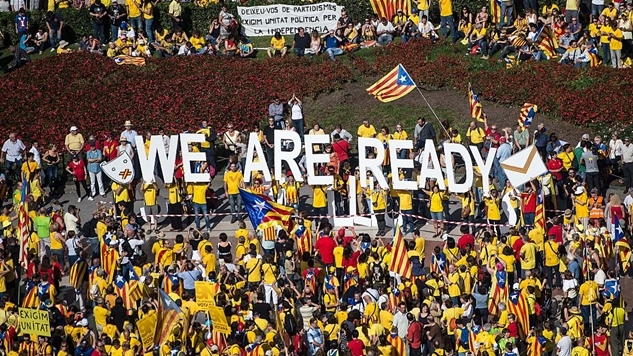 This is not the first time that Catalonians have seriously considered secession. Independence is a popular topic in Europe these days. Whether it be the United Kingdom exiting from the EU, Scotland wanting to separate from the UK or Catalonia from Spain, one thing is certain: Europeans are fed up with European governments. After hovering around 10% in the years after the 2008 financial crisis, Europe has nudged its unemployment rate down to 7.7%—but it’s still nearly double that of America’s unemployment rate of 4.3%. There are a lot of reasons behind Europe’s decline, and no one culprit can shoulder the entire blame, but the message from the people of Europe to their leaders is crystal clear: change the status quo or we’ll change it for you. UPDATE: Spain’s public prosecutor’s office will file rebellion charges next week against Puigdemont. The crime is punishable by up to 30 years in prison. 2nd UPDATE: The Senate ratified this decision, and Prime Minister Rajoy has officially announced the dismissal of Catalan President Puigdemont, he dissolved the Catalan parliament, abolished the office of the regional and deputy prime ministers, suspended the top officials of Catalonia’s regional police, and called for a new regional election on December 21st.